What causes swimmers’ hair and how to care for it? Home / Chlorine Removal Tips / What causes swimmers’ hair and how to care for it? The best swimmers’ hair care is prevention. But because many people who find this article missed the prevention step, we will also cover how to care for swimmers’ hair if you already have it. For those of you who are in a panic and want to know immediately how to fix swimmers’ hair then jump to the bottom of this post. Swimmers’ hair care: I’ve got it, how can I fix it? Before you swim: Protect your hair from chlorine. After you swim: Get the chlorine off. At home: What to do in between swims? Swimmers’ hair care: I’ve got it, how can I fix it? Swimmers’ hair is badly damaged hair caused by swimming in chlorinated pools. It becomes dry, brittle and sometimes is accompanied by a light green tint. Swimmers do many other things to complicate the problem, but the main cause of swimmers’ hair is exposure to chlorinated pools. The outer layer of the hair shaft is called the cuticle. Under normal conditions, hair is slightly acidic, and the scales of the cuticle lie flat. When the cuticle scales lie flat they protect the inner layers of the hair shaft and keep the moisture in. As a result, the hair is strong and looks shiny and healthy. Here is a good article talking about the anatomy of healthy hair. But swimmers are constantly exposed to pool water which is kept slightly alkaline. As swimmers’ hair is exposed to pool water, the cuticle scales lift and the inner layers of the hair shaft are exposed. The pool chemicals, and especially chloride atoms, attach themselves to the swimmer. Because the cuticle scales have lifted, swimmers’ hair is particularly vulnerable to pool chemicals. Contrary to common belief, swimmers’ hair doesn’t turn green because the pool is dying their hair. Swimmers’ hair turns green because some pools have lots of copper and metals in the water. Chloride atoms oxidize the copper, and then attach to swimmer’s hair. Over time, and if enough copper collects, the swimmers’ hair will have a green tint. Think old copper roofs, or old copper pennies that have turned green. Before you swim: Protecting your hair from chlorine. Hair absorbs water like a sponge. One of the best things you can do before swimming is to wet your hair in the shower. Let your hair absorb as much tap water as possible. You can then treat your hair with a little natural oil or a hair conditioner. This will create a thin barrier and help keep the pool water out. Wear a swim cap. There is nothing that will keep all of the pool water off your hair, but a swim cap is about the best barrier available. A swim cap will reduce drag and make you more streamlined as well. Wet your hair in the shower before you swim. Apply a little natural oil, or conditioner. Chlorine does a fantastic job of disinfecting everything in the pool–including the swimmers. When you get out of the pool, I guarantee you are about as clean as you will ever be. After a swim (in a bunch of pool chemicals) you don’t really need more harsh chemicals. First and foremost, swimmers need products that will remove the pool chemicals, and most importantly, the chlorine. After removing the chlorine, quality products will then help balance the pH and restore moisture lost from swimming. 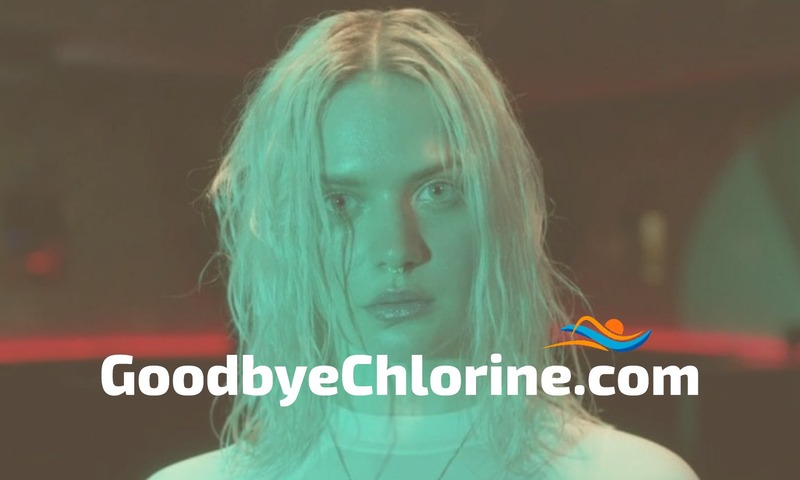 Goodbye Chlorine’s soap and shower gel are great products to use on your body. Our shampoo and conditioner works extremely well on your hair. Use our shampoo sparingly. Follow with our conditioner to put moisture back into your hair. Apply a lotion that adds moisture back into your skin. Make sure it is pH balanced as well. Use a swimming-specific soap or shower gel on your body. Use Goodbye Chlorine conditioner on your hair in the shower. Apply swimmer-specific styling products for your hair. Moisturize your skin with lotion. The showers you take in between swims matter. For competitive swimmers the number of home showers will be fewer, and recreational swimmers will take more. The battle of chlorine continues at home. Harsh soaps and shampoos should be avoided at all costs. Clarifying shampoos, for instance, will make swimmers’ hair worse. Swimmers should use products that release and gently remove chlorine, balance the pH of their hair and skin and moisturize. Goodbye Chlorine’s soaps are good to use at home. They are extremely emollient. They also have tons of vitamin C which is great at releasing chlorine. Swimmers’ hair care routine should exclude shampoos and include specialized conditioners and styling products. The key to maintaining healthy hair is to continue gently removing chlorine while adding back moisture. So you have a bad case of swimmer’s hair and you want to know how to fix it? Jump here and buy our conditioner. Then come back and read the rest of this article. This is no ordinary conditioner, it is specialized for swimmer to help prevent hair from becoming damaged from swimming pool water. Our conditioner will repair damaged hair that is dry and brittle–otherwise called “swimmer’s hair“, “pool hair”, or “chlorine hair”. Stop using shampoo or other soaps that strip away moisture. Using these types of products will only make matters worse because the chlorine attached to your hair has a very strong bond that normal soaps won’t remove. Products that are designed to release the chlorine can do it without harsh soaps, and that’s a big benefit for people with damaged hair. Harsh soaps will only make matters worse. There are many D.I.Y. home remedies and some of them probably work–especially those products that contain vitamin C. Vitamin C is very effective at neutralizing chlorine, so things like ketchup and lemons are likely to help. Our products work much better, however. Consider our soap which has 1,000’s x more vitamin C than a bottle of ketchup for example. Think of our hair conditioner as a conditioner-cleaner. It releases chlorine, moisturizes, balances pH and gently removes impurities. If you already have a bad case of swimmer’s hair, then wet your hair, apply generous amounts of conditioner, wrap your hair in a towel and let sit for 10-20 minutes. Rinse out and repeat if necessary. If your hair is severely wrecked then you may have to repeat a few times. After this initial treatment, then continue using the conditioner as recommended before and after swimming. Keep drying chemicals and harsh soaps away from your hair. How Do Swimmers Get the Chlorine Off? Next post: Swimmers’ shampoo, will it fix swimmer’s hair?